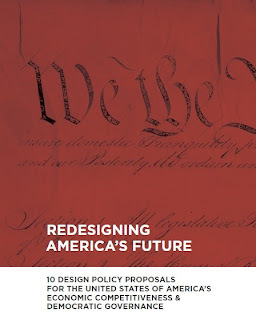 Eu gostaria de comentar a questao "why the u.s. doesn't have a national design policy?". Existe uma expectativa geral de que a receita ideal para todo pais eh 'politica+programas de design com dinheiro publico para implementacao'. Este 'conceito ideal' ignora as particularidades de cada pais, especialmente o sistema politico e economico. O fato eh que alguns paises (inlcuindo EUA) tem um modelo de mercado aberto, onde a competitividade define a sobrevivencia de empreasas. Nestes casos, a tarefa do governo passa a ser garantir uma economia estavel, educacao, informacao, e leis que facilitem empresas operar e competir no mercado. Neste contexto, o apoio do governo ao design eh dado indiretamente. O ponto onde quero chegar eh que politicas publicas de design precisam ser diferentes de um pais para outro, tomando em consideracao o sistema politico e economico, alem de fatores sociais e culturais. Nao existe uma receita. this question was aroused in the debate that followed the international design policies forum during the brazil design week, by manoel muller, president of abedesign, if i remember well. according to himself, it was merely provocative, and in the debate what was said was precisely that in a market-oriented economy like the usa, the role of the government is indirect. even so it is possible to conclude after reading the document "redesigning america's future" that the american societies' longings are considerably orthodox in what regards design policies: creation of a design council to work together with government; creation of a design secretary to advise the department of commerce; bigger public investments in design research; comission a report about design as a tool of economic development; foster direct governmental investment in design innovation, and so on... from ten proposals listed on the document maybe two relates more directly to questions related to the usa now (and even those could be considered in any other national design policy program). ie, notwithstanding agreeing with your statement that public design policies must be different from one country to another, that there isn't a recipe, one question remains: does the current crisis bring us together into the formulation of an "ideal model" for public design policies?